A site dedicated to the X-Men! Jubilation Lee is a Chinese American girl born in Beverly Hills, California, where she lived with her wealthy immigrant parents. However, her life was destroyed when her parents were murdered by hitmen. Jubilee was sent to an orphanage, but she ran away and hid in the Hollywood Mall, stealing food to survive. She first discovered her mutant power while running away from mall security and realized that she could earn money by using her powers to entertain customers in the mall. The mall security hired mutant hunters known as the M-Squad to capture her. Jubilee initially held her own by blasting the M-Squad's energy tractor beams, but she was eventually caught by them. She was rescued by X-Men members Dazzler, Psylocke, Rogue, and Storm, who happened to be shopping at the mall. Curious about the women, she tracks them for a while and later follows them into a portal. At the X-Men's Australian Outback base, she stayed in hiding, stealing food to survive. When the cybernetic Reavers captured Wolverine and tied him to a X-cross, Jubilee rescued him, nursing him back to full health. When the Reavers came for them, they escaped and made their way to the island Madripoor where they found Psylocke brainwashed into service to Matsu'o Tsurayaba. They defeat Matsu'o and the Mandarin; and freed Psylocke after which they traveled around the world for missions. They ended up at the mutant island Genosha to help the various X-teams fight the country's anti-mutant government. 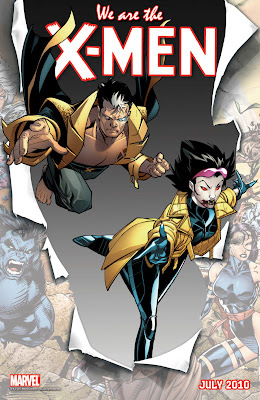 Jubilee joined the X-Men and participated in a mission in the alien Shi'ar Empire. 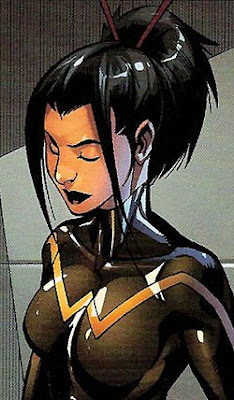 She joined the X-Men Blue Team and participated in several missions, mourning the death of Illyana Rasputin to the mutant-killing Legacy Virus. 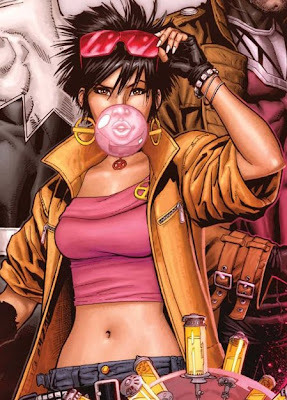 Jubilee was placed in Generation X so that she can be with people around her age. After Generation X disbanded, she moved to L.A. with teammate Synch to pursue an acting career. However, she was mainly cast in stereotypical Asian roles and after her agent tried to seduce her, she blasted him with a powerful plasma blast. Around this time, she joined former teammates Husk and M at their former mentor Banshee's new militaristic outfit X-Corp to keep an eye on him. When the outfit was infiltrated and attacked by Mystique and her Brotherhood, the trio helped the X-Men stop them. She returned to L.A. to be with Synch but both of them were kidnapped by the anti-mutant Church of Humanity and crucified on the front lawn of the Xavier Institute. While Jubilee survived with the help of Angel's blood, Skin died. 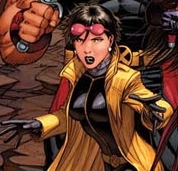 Jubilee went on to join the X-Men for several missions before she was taken off the active roster. Jubilee was contacted by a long lost relative, Aunt Hope and moved in with her in L.A.. Jubilee attended Payton Noble High School. However, Hope was an assassin caught up in a crime ring. When Wolverine visited Jubilee, the two of them along with Hope and butler Brad got into a battle with Hope's former boss. Hope was killed in an explosion and seemingly died. A distraught Jubilee returned to the Xavier Institute with Wolverine. Jubilee lost her powers along with most of the mutant population during M-Day. She ran a halfway house in New York for depowered mutants but was kidnapped by Omega Red and badly beaten. Wolverine eventually used the world peacekeeping agency S.H.I.E.L.D. to rescue Jubilee. Jubilee next surfaced as Wondra, with technological-based super strength, joining the New Warriors. After leaving New Warriors, she made her way to San Francisco but refused to join the X-Men or enter the mutant island Utopia. Cyclops sent teenage X-Man Pixie to check on Jubilee. During this time, Jubilee was infected with a mass bio-engineered virus released by a vampire suicide bomber. This virus turned her into a vampire. Jubilee is able to survive with Wolverine's blood. Jubilee was brought in by Gambit to help Wolverine's clone X-23 to live a normal life. Following the schism, Jubilee remained at Utopia to be away from the students at Wolverine's school. She joined Psylocke's security recon team. She left after a few missions to learn to master her vampiric powers. She returned to the Jean Grey School with a baby she found and subsequently re-joined the X-Men.